Join us for a mid-summer tasting of a variety of exciting, unique and new ciders! 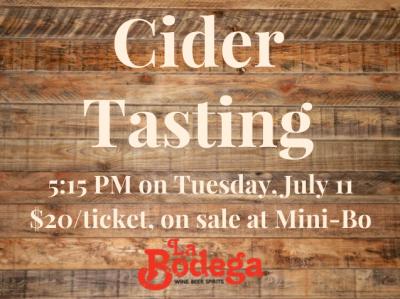 Join Chris and La Bodega at the Spenard Mini-Bo for an event that pairs delicious, refreshing ciders with food plates from our neighbors Hearth Artisan Pizza. The event starts at 5:15 PM on Tuesday, July 11th. $20 tickets are on sale now at the Mini-Bo, and include the flight of ciders and Hearth food pairings.